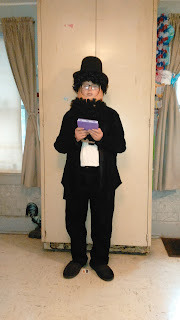 And the costumes (Henry Hudson) (Abe Lincoln). 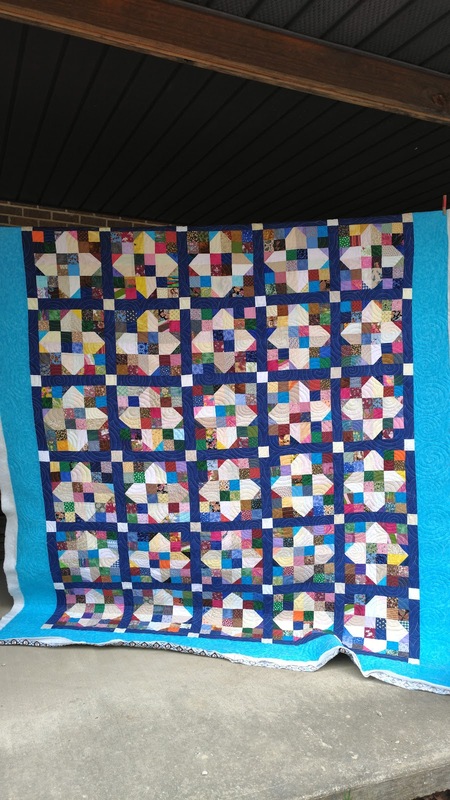 Finished 10.18.17 100" x 112" More pictures here. 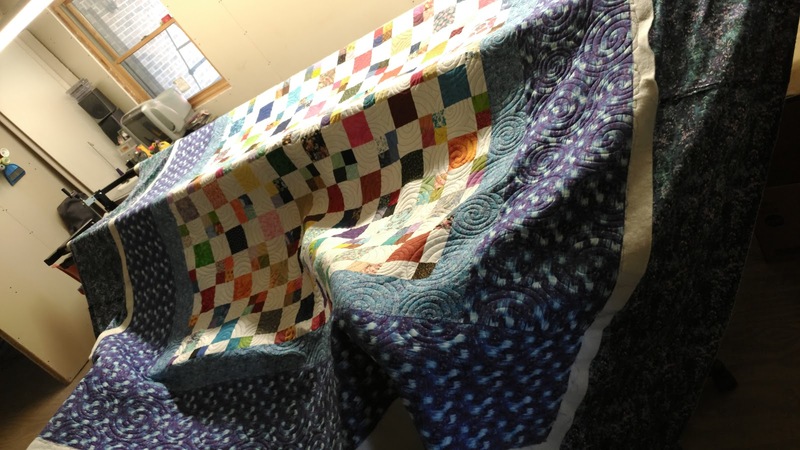 Finished 9.15.17 62" x 69"
Marvelous Mini Monday Mystery @ Temecula Quilt Co. Finished 9.8.17 24" x 31"
Finished 7.21.17 35" x 44"
Finished 7.14.17 38" x 45"
Finished 7.7.17 62.5" x 72.5"
Finished 7.7.17 100.5" x 93.5"
Finished 5.25.17 56" x 81"
Finished 5.19.17 38.5" x 43.5"
Finished 5.12.17 35" x 27"
Finished 5.5.17 36" x 51"
Finished 4.28.17, 59" x 72"
Finished 4.21.17 28" x 42"
Finished 4.14.17 61" x 93"
Finished 4.7.17 97" x 97"
Finished 3.17.17 28" x 44"
Finished 3.3.17 84" x 100.5"
Finished 2.27.17 41" x 55"
Finished 1.27.17 41" x 54.5"
Finished 1.20.17 10" x 13"
Finished 1.13.17 46" x 46"
Finished 1.6.17 21" X 21"
In 2016 I concentrated on finishing charity quilts for my local guild. You can see them here. Finished 8.5.16 40" x 48"
Finished 3.28.15 44.5" x 55"
Finished 2.6.15 43" x 57"
Finished 1.26.15 73" x 87"
Finished 12.26.14 27" x 35"
Finished 12.12.14 27" x 35"
Finished 12.19.14 16.5" x 19"
Finished 11.21.14 57" x 72.5"
Finished 10.31.14 75" x 87.5"
Finished 9.12.14 40" x 40"
Finished 7/10/14 41" x 53"
Finished 4/25/14 32.5" x 57"
Finished 3/28/14 45" x 50"
Finished 3/21/14 68.5" x 68.5"
Finished 3/14/14 27" x 27"
Finished 3/7/14 17" x 20.5"
Finished 1/31/14 50" x 50"
Finished 1/20/14 66" x 83"
Finished 1/17/14 43" x 60"
Finished 1/10/14 60" x 60"
Finished 12/13/13 27" x 35"
This quilt top was donated by a LQG member. It measures 41" x 56". 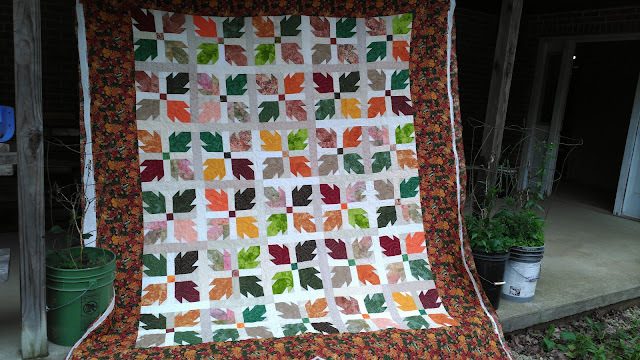 Finished 11/13/13 81" x 93"
Finished 9/20/13 45" x 50"
Buckeye Beauty Mystery quilt at Made With Love by Mary's blog. 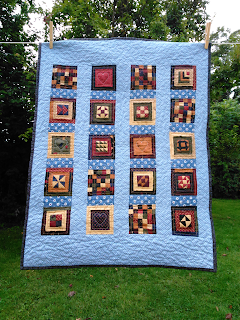 This quilt was made during the Tetris QA with Melissa at Happy Quilting. It finishes 60" x 80". It was made with garage sale scraps. It was quilted on my domestic sewing machine using the dogwood quilting pattern. See more details here. 82" x 92". The back is pieced with a lot of different fabrics. 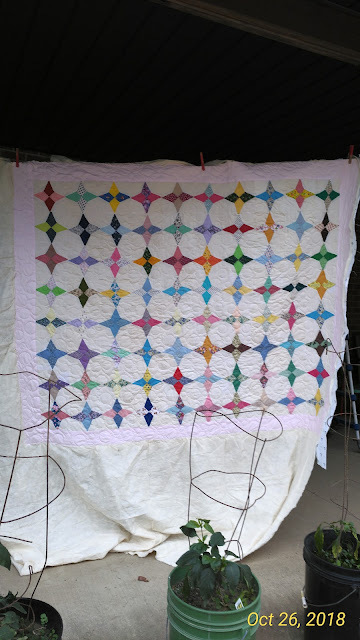 This is not my favorite back, but it works for this quilt. It's perfect for our couch. 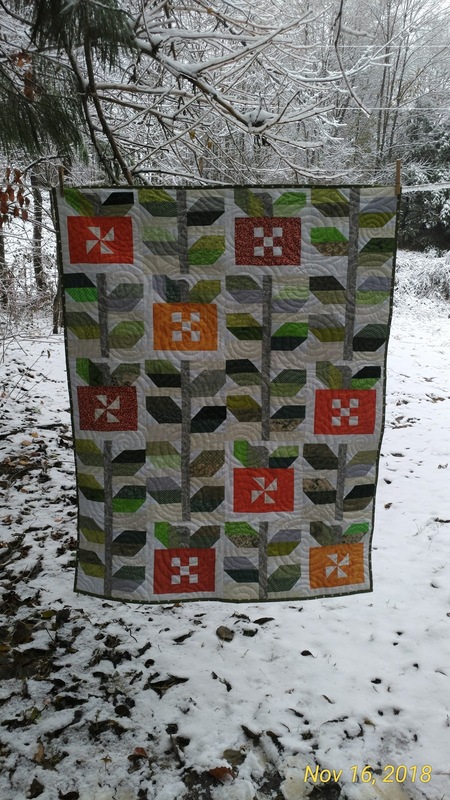 The Pineapple Blossom design is by Bonnie Hunter of Quiltville's blog. 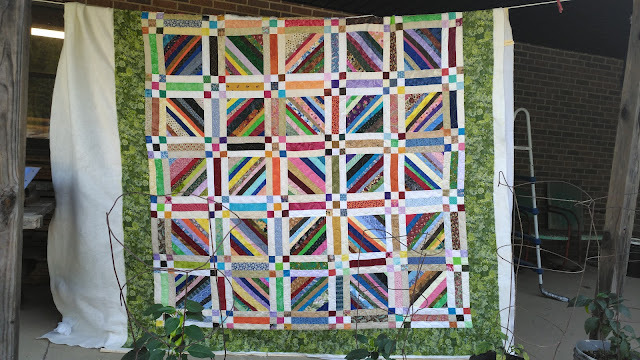 Blocks are color controlled with each block having two yellow and two grey fabrics in each block. 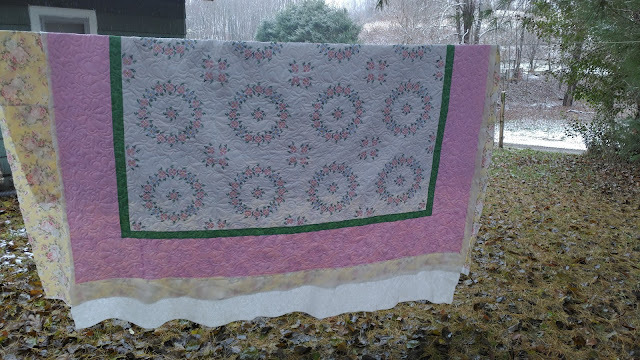 This is my fist attempt at sashing. Love the sashing and cornerstones! The binding is very very scrappy. No additional fabrics were purchased for this quilt. Everything I added was from my stash. Some of the pineapple blossoms are echo stitched. 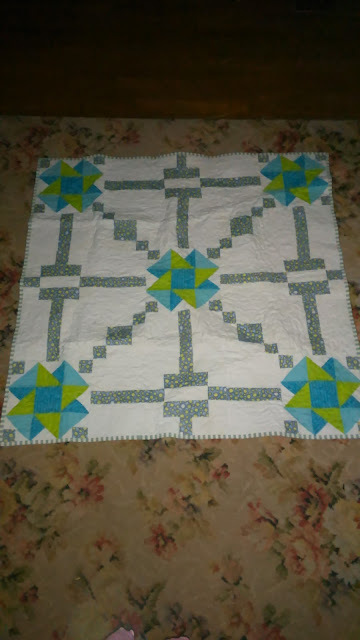 The sashing has straight line quilting all around it. 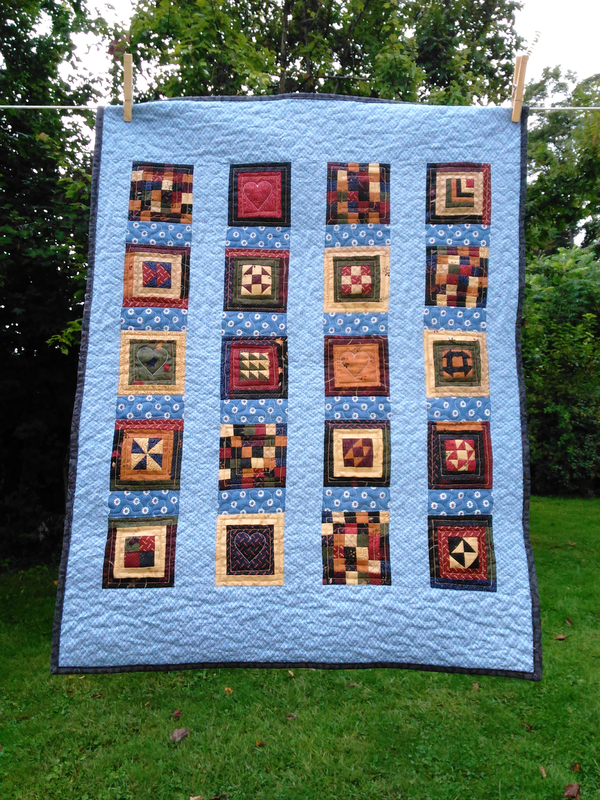 This is the first quilt that I used my straight line attachment for my machine. Here's the very pieced back. I was still not sure if I like all these colors and pieces. But it is really growing on me as I use it on the couch. You can tell in this picture that the border is scrappy as well. 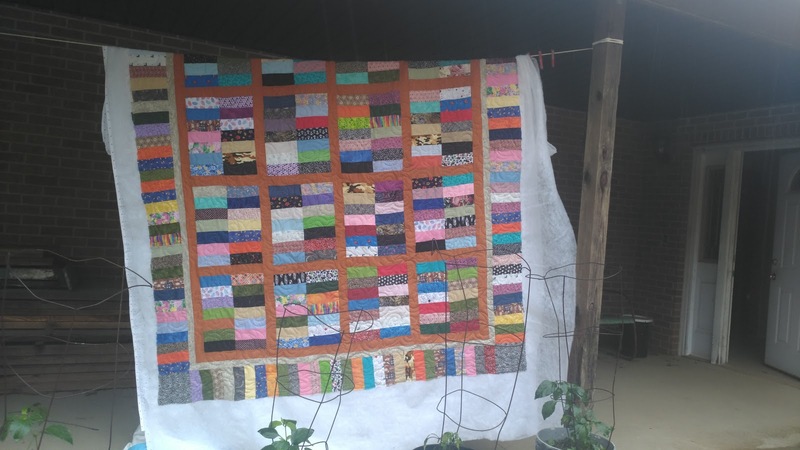 This quilt measures 42" x 54"
She sent them to me a YEAR ago! Thanks, Kate! Finished four doll quilts for the 2012 Get Your Mrs. Claus On. These are the other crumb blocks that I made that I didn't think that the colors matched those from Kate. Here are the backs. I like the little Accuquilt GO! Baby die that helped me make these. It's in the "Die to Try" section on the Accuquilt page. 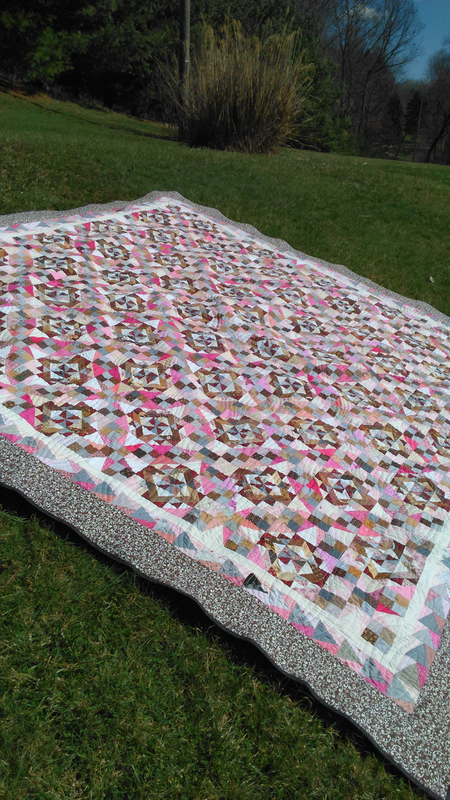 These little doll quilts will be shipped to Debbie later this year for charity. This quilt measures 48" x 51". Fabric was on clearance at JoAnn's for $2/yd or less. 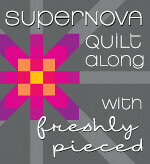 No needles were broken in FMQ. 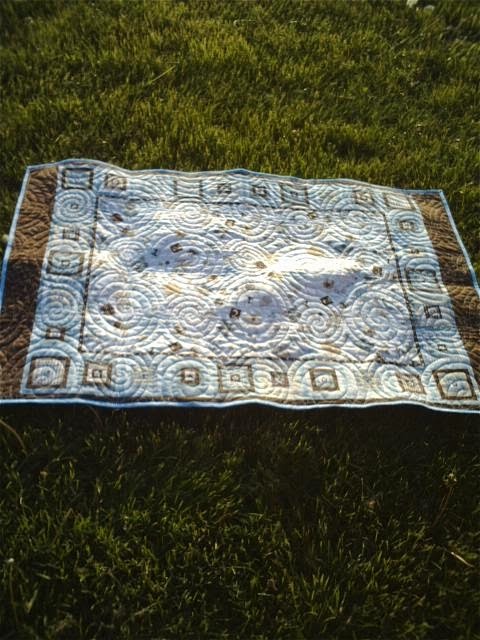 because of Judy at Patchwork Times and the 2012 UFO Challenge, it is done! The pattern is from Sunflower Seeds Awesome QA with Jamie Mueller. 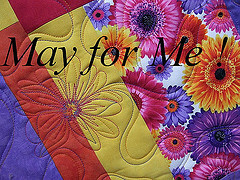 This quilt was donated 6/2/12 to Sarah at http://confessionsofafabricaddict.blogspot.com/2012/05/hands2help-show-off-your-quilts.html for the H2H Challenge. It was for The NOLA Project. Love the grid-line finish on this! Finished size 10.25" x 12". Finished size 42" x 53". Heidi at Honeybear Lane did a great tutorial on this. My first try of ironing freezer paper to keep a quilt together. Accuquilt "Die to Try" animals. Very quick and easy! The back is nice and flat! 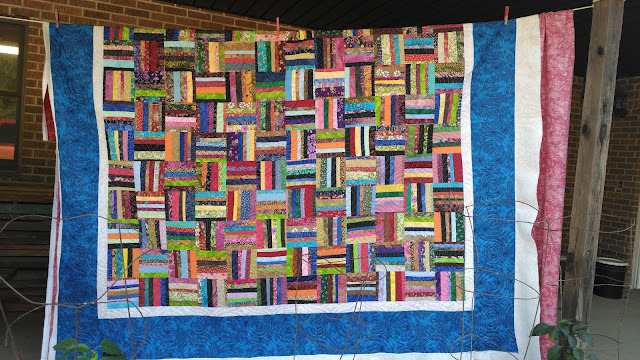 This quilt measures 72" x 82". My stippling is getting much, much better. I still need to working on getting the back completely flat! 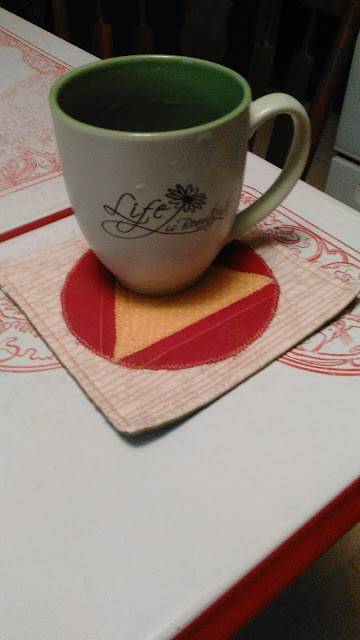 It is my first scrappy binding. It is my first machine stitched (zigzag) binding -- I LOVE IT! ZERO jean needles broken during FMQ -- Whohoo! These blocks were won in the January 2012 block lotto. The block is called Eclipse. The color control theme was bright and light. When I received each block I machine embroidered the first name and location of the block maker. Six countries and eight different states are represented. I am very proud that I purchased ZERO fabrics! All materials needed were from my stash!!! Quilt size 41" x 56"
Used Leah Day's technique of making the border larger and not quilting edge to edge; trim. This is my favorite pieced back so far. 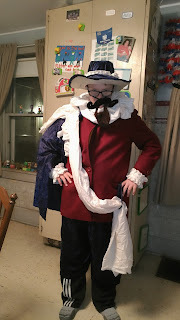 It was completely made from scraps! All half square triangles and squares cut with Accuquilt Baby GO! value die. This quilt is special because it is a charity quilt for DSSN (Down Syndrome Support Network) of my county in Ohio. Quilt raffle is on March 17, 2011. Thanks to all that purchased tickets! Good Luck! Finished size 42" x 56". I only broke ONE needle while FMQ! 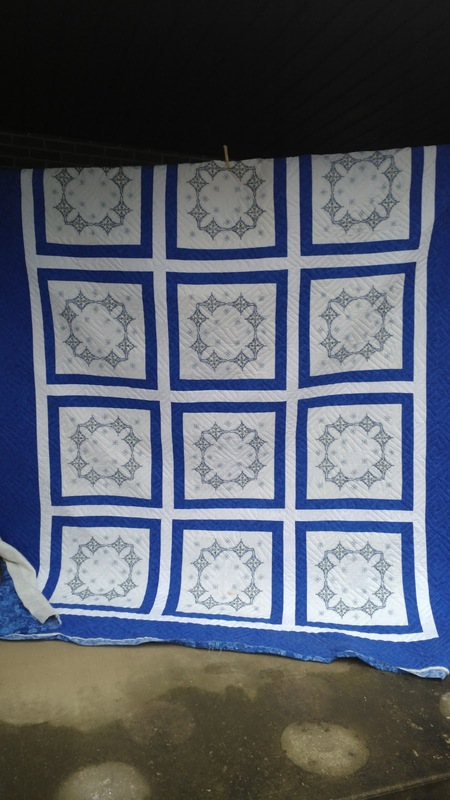 I am now using jean needles for FMQ. Nice, flat pieced back. 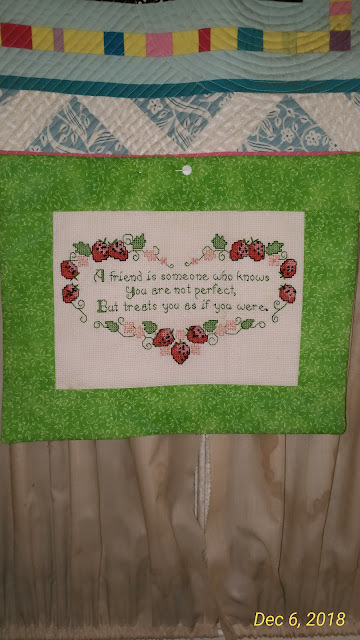 I'm very happy with the FMQ! This quilt is a charity quilt for my local quilt guild. It will go to a child at the Akron Children's Hospital. Hopefully it will bring comfort. 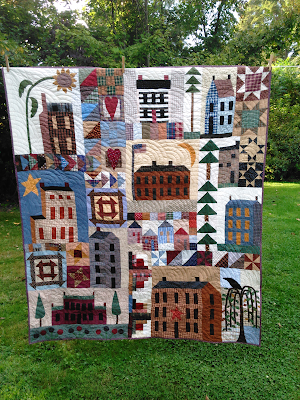 This tiny quilt is 24" x 28". It is a charity quilt for my local quilt guild. It will go to a tiny baby born in the NICU at Akron Children's Hospital. 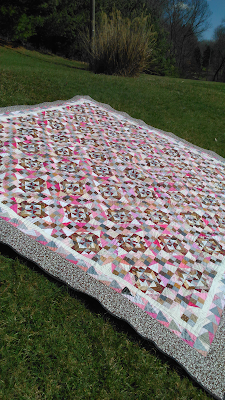 FMQ stipple was very even. The back was very flat. Used polyester cone thread from JoAnn's ($2/cone) and jean needles. It measures a little 20.5" by 20.5". 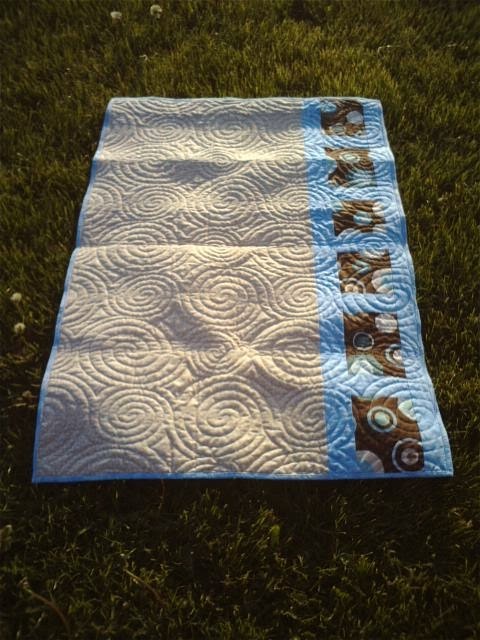 Part of the purpose for this QA was to do hand stitching and FMQ. I opted to not do the hand stitching because I don't think I'll ever want to do that. BUT I did use the stitch on my machine and the clear thread on the top that made the machine stitching have the look of hand stitching. It was hosted by the blogs: Contended (Rachel) and Quilter In The Gap (Rhonda). The back is a little puckered... grrr. But it seemed to straighten out once we used it and washed it--whew. I used FMQ on it with varigated Signature varigated thread -- YUCK! 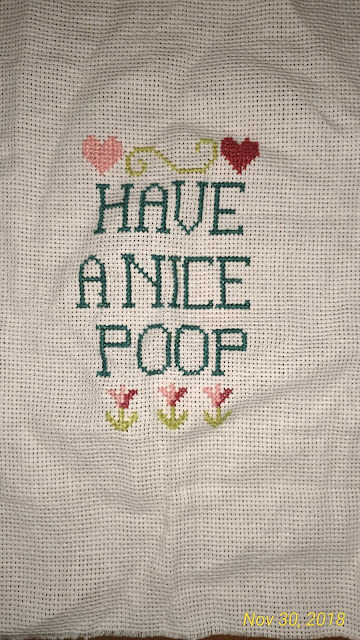 felt committed to finish it with the thread I started. I do LOVE the pieced back! for the armrests it is 52" wide for 24" I used the broken dishes blocks on the underside of the armrests. It took 79 broken dish blocks to make this cover. Finished block size is 8" square. 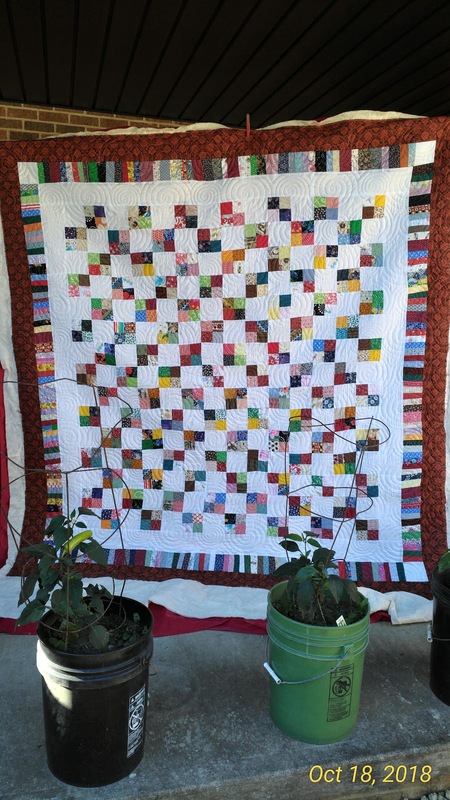 This is sthe first quilt that I started in 2011. I picked out all the colors just by strolling the aisles of JoAnn Fabrics and hoping they went together. I think I did okay for my first California King quilt. Finished size 81.5" x 101"
This is the insteractive back. There are little things that a baby would like such as little loops for toys. Here's the only part I'm not sure of, but at this point it's staying. It's a monkey tail. Gotta love a link-a-do holder. Here's an interesting giraffe tail. The front is made from panels I purchased at JoAnn Fabrics. It was supposed to be a book. 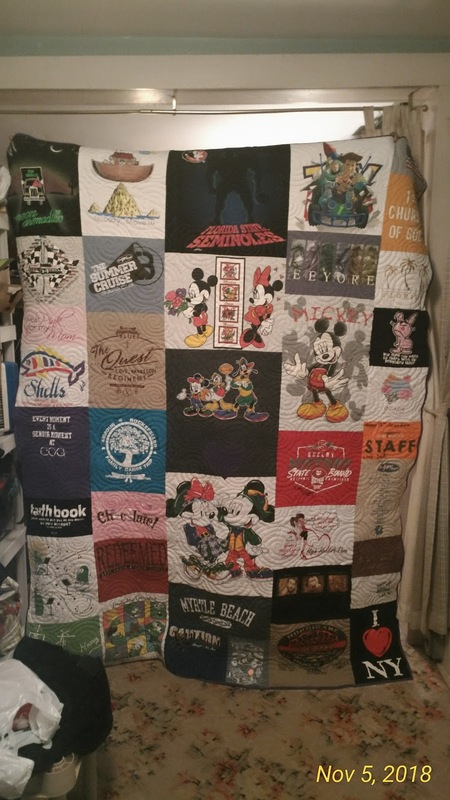 You can read the front of the quilt like a book. 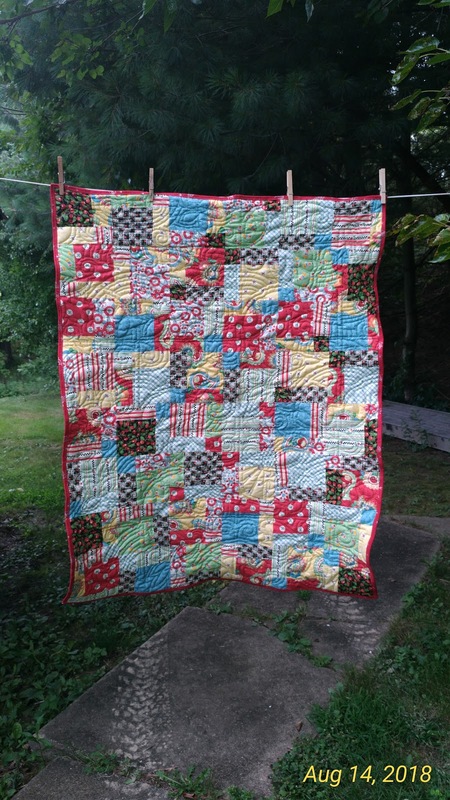 This quilt was made for my niece's first baby boy. Finished size approx. 50" x 62"? Yes, there is Ronald McDonald fabric at the top of the back. I couldn't resist. In the yellow strip are all of the "saved" half square triangles that were cut when making the blocks. The large section is made from one of my favorites -- Picnic Ants!